Canada’s share of the world economy, based on GDP for all goods and services, is estimated at approximately 1.8%.e Canada’s total share of the annual global LCGS market is approximately $6.3 billion of a total of $339 billion (or approximately 1.85%). 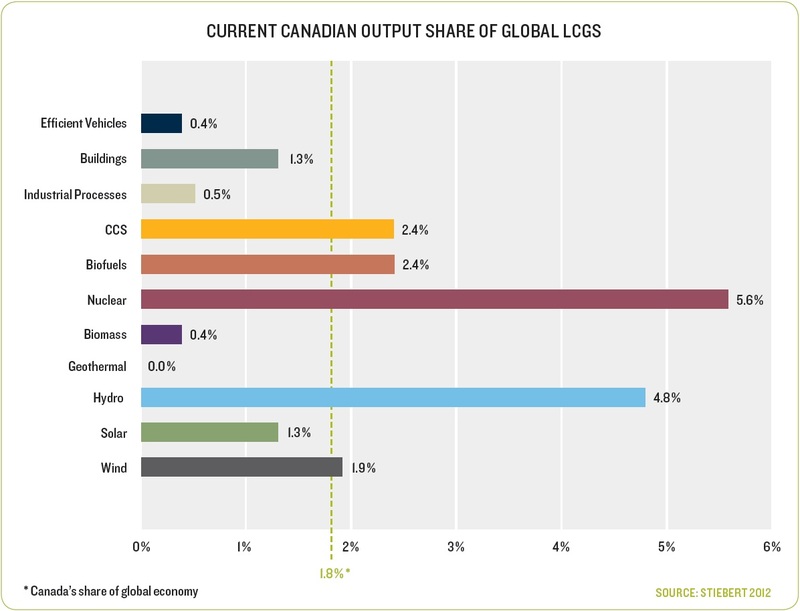 While this puts Canada’s current overall share of the global LCGS market on par with its relative share of the world economy, the share for each individual LCGS sector varies substantially. Figure 3 presents our estimates of Canada’s relative share of output for the LCGS sectors. In 2010, Canadian output in the nuclear, hydro, biofuels, CCS, and wind LCGS sectors all exceeded Canada’s share of the global economy. A comparison of the global share results presented above with our analysis of how LCGS sectors will evolve over time reveals that the areas where Canada has a large share of the global market do not coincide with the areas that are expected to benefit from the largest demand in the years to come (i.e., efficient vehicles, buildings). While Canada’s apparent existing strength in hydro would be expected to continue under both the reference and carbon-constrained scenarios, the global share of Canada’s CCS, and to a lesser degree wind sectors, would be expected to remain above average only under the carbonconstrained scenario.f,g,h If Canada were to capture its average 1.8% of global LCGS output in 2050, domestic production would range between $70 billion and $149 billion under the global BAU and carbonconstrained scenarios, respectively. This represents roughly double Canada’s forecasted domestic market under comparable scenarios and highlights the magnitude of the opportunity to supply growing global demand for LCGS. While in 2010 Canada came very close to a balanced position for merchandise trade, overall, Canada’s trade balance for manufactured goods was negative, balanced by exports of raw materials, energy, and primary/intermediate goods. 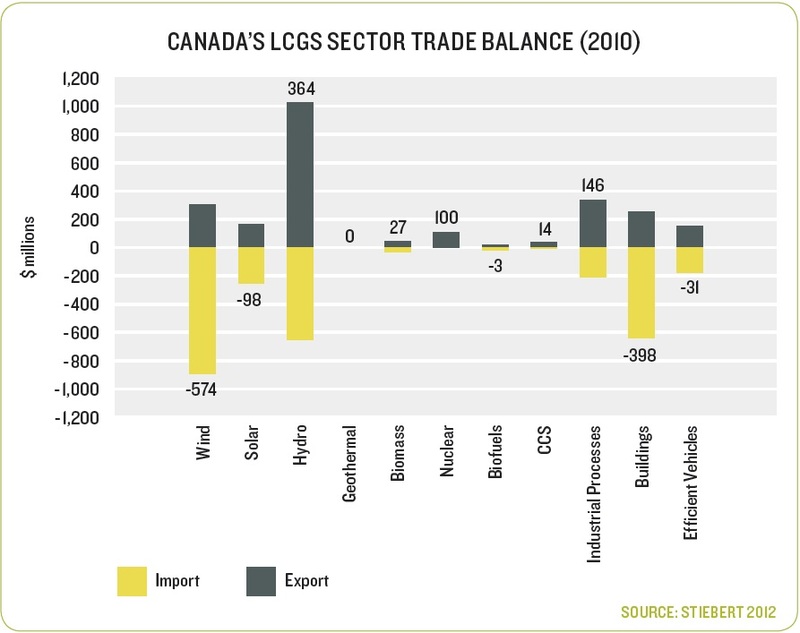 Particularly given this overall trade landscape, Canada’s trade balance for its LCGS sectors (presented in Figure 4) points to the potential significance of hydro, nuclear, and efficient industrial processes, which exhibit sizeable, positive trade balances in 2010.i Biomass and CCS also demonstrate net positive trade balances. Combining Canada’s relative share of world output with information concerning Canada’s trade balance provides a starting point for assessing Canada’s current contribution to meeting global demand in these 11 sectors. This can be seen as a rough proxy of Canada’s competitive position for these sectors, in the absence of more comprehensive trade data that could provide an understanding of revealed comparative advantage. Hydro and nuclear are uniquely positioned as exhibiting both above-average shares of global output and significant positive trade balances. CCS also presents a small positive trade balance as well as an above-average share of global output. The efficient industrial process sector is shown to have a sizeable trade surplus and a below-average contribution to global output. This is perhaps indicative of economic strength in an area currently in greater demand globally than domestically. 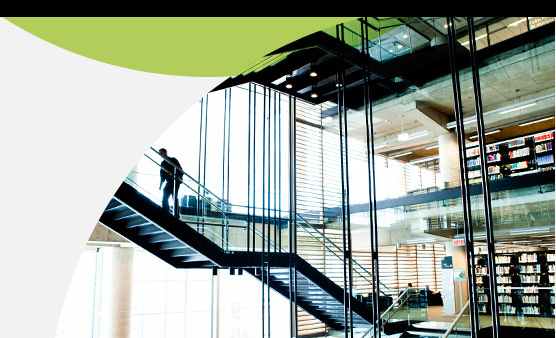 While such analyses contribute to understanding Canada’s strengths, the potential for success of companies in specific sectors and the benefits to the Canadian economy are not limited to product areas / sectors identified through such methods. In a 2010 analysis of global climate-friendly trade, the Conference Board of Canada highlighted a number of products for which Canada exhibited a revealed comparative advantage (i.e., for which Canada’s proportion of global exports is greater than its overall average proportion of global exports).28 It also highlighted four product areas where, despite lower-than-average proportional trade, Canada’s global exports for each product category exceeded $100 million in 2008.j The analysis also identified Canada’s strength in the manufacturing of gas turbines of less than 5 MW. While Canada’s exports accounted for fully 20% of global exports for this product category and its share was growing rapidly, the overall market for this product was noted to be relatively small and growth had been flat over the previous several years. 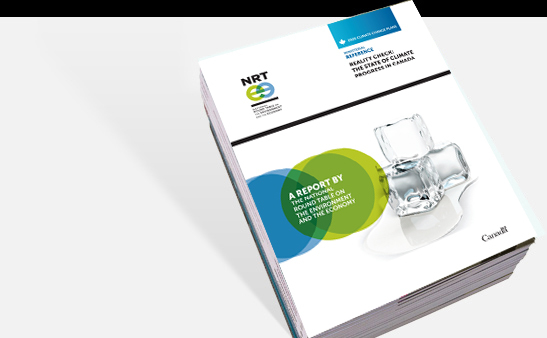 Together, these examples point to the importance — particularly from a supportive policy perspective — of understanding sector growth potential and the potential benefit in capturing even a very small portion of a quickly expanding market. 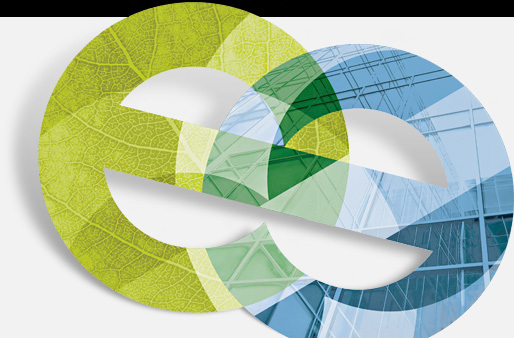 As Canadian investors consider where the greatest potential for future growth lies and policy makers assess how best to support low-carbon growth, they will require intelligence about Canada’s current share of global LCGS markets, competitiveness, and forecast future spending domestically and abroad to inform good decision making. 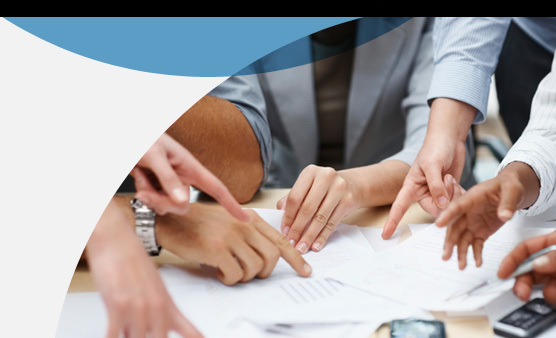 Awareness of global markets for different LCGS sectors including the presence of trade or other barriers to entry will be critical to the success of Canadian companies. [e] Canada’s GDP compound annual growth rate averaged 1.7% between 2001 and 2010. Under the reference and carbon-constrained scenarios respectively, overall LCGS value-added (GDP) growth is projected to be 3.4% and 5.1%, respectively. [f] Complete results are presented in Stiebert 2012 (available upon request). Comprehensive analysis was limited by the use of two separate models (IEA and CIMS), which precluded dynamic expression of trade relationships and introduced the possibility of underlying differences in model assumptions despite efforts to align definitions. [g] Canada’s apparent existing strength in the nuclear industry was not apparent in the long-run analysis due to an underlying policy assumption concerning potential future increases in nuclear capacity. For the purposes of this exercise, it was assumed that nuclear capacity would increase to align with planned refurbishments and expansions, but that no new capacity requiring facility siting would be included. This effectively capped nuclear capacity at 2030 levels for the forecast period. [h] Canada’s apparent existing strength in biofuels was only maintained under the Lock-in scenario, which required deep GHG reductions within a compressed time period. [i] The geothermal sector’s zero trade balance is evidence of the increasing complexity of global value chains and the role of direct investment in global markets, particularly for technologies which are difficult to transport (Conference Board of Canada 2010). As of 2010, Canada had six geothermal projects actively under development domestically, and Canadian-based geothermal companies had four operational facilities in Iceland and the U.S. (Islandsbanki Geothermal Research 2010). [j] These four areas were solar collectors, solar system controllers, and heat exchangers; equipment for heat treatment (excluding furnaces, ovens, etc. ); gas turbine parts not elsewhere specified (does not include turbo-jets or turbo-propellers); and gears and gearing and other speed changers (specifically for wind turbines).